The electronics for motion control systems, routers, and 3D printers are split into two camps. The first is 8-bit microcontrollers, usually AVRs, and are regarded as being slower and incapable of cool acceleration features. The second camp consists of 32-bit microcontrollers, and these are able to drive a lot of steppers very quickly and very smoothly. While 32-bit micros are obviously the future, there are a few very clever people squeezing the last drops out of 8-bit platforms. That’s what the Buildbotics team did with their ATxmega chip — they’re using a clever application of DMA as counters to drive steppers. The usual way of driving steppers quickly with an ATMega or other 8-bit microcontroller is abusing the hardware timers. It’s quick, but there is a downside. It takes time for these timers to start and stop, and if you’re doing it two hundred times per second with four stepper motors, that clock jitter will ruin your CNC machine. The solution is to use a DMA channel to count down, with each count sending out a pulse to a stepper. It’s a clever abuse of the hardware, and the only drawback is the micro can’t send more than 2¹⁶ pulses per any 5ms period. That’s not really an issue because that would mean some very, very fast acceleration. The Buildbotics team currently has a Kickstarter running for their four-axis CNC controller using this technique. It’s designed for Taig mills, 6040 routers, K40 lasers, and other various homebrew robots. It’s an interesting solution to the apparent end of the of the age of 8-bit microcontrollers in CNC machines and certainly worth checking out. 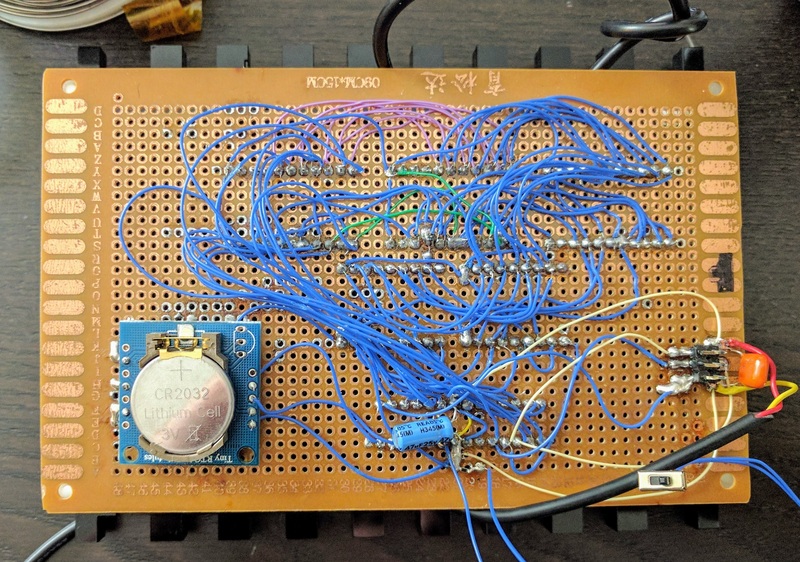 Hackaday Prize Entry: You Can Tune A Guitar, But Can You Reference REO Speedwagon? Just for a second, let’s perform a little engineering-based thought experiment. Let’s design a guitar tuner. First up, you’ll need a 1/4″ input, and some op-amps to get that signal into a microcontroller. In the microcontroller, you’re going to be doing some FFT. If you’re really fancy, you’ll have some lookup tables and an interface to switch between A440, maybe A430, and if you’re a huge nerd, C256. The interface is simple enough — just use a seven-segment display and a few LEDs to tell the user what note they’re on and how on-pitch they are. All in all, the design isn’t that hard. Now let’s design a tuner for blind musicians. This makes things a bit more interesting. That LED interface isn’t going to work, and you’ve got to figure out a better way of telling the musician they’re on-pitch. This is the idea of [Pepijn]’s Accessible Guitar Tuner. It’s a finalist in The Hackaday Prize Assistive Technology round, and a really interesting problem to solve. Most of [Pepijn]’s tuner is what you would expect — microcontrollers and FFT. The microcontroller is an ATMega, which is sufficient enough for a simple guitar tuner. The real trick here is the interface. [Pepijn] modulating the input from the guitar against a reference frequency. The difference between the guitar and this reference frequency is then turned into clicks and played through headphones. Fewer clicks mean the guitar is closer to being in tune. This is one of those projects that’s a perfect fit for the Hackaday Prize Assistive Technology round. It’s an extremely simple problem to define, somewhat easy to build, and very useful. That doesn’t mean [Pepijn] isn’t having problems — he’s having a lot of trouble with the signal levels from a guitar. He’s looking for some help, so if you have some insights in reading signals that range from tiny piezos to active humbuckers, give him a few words of advice. After acquiring five 4-character, 16 segment display modules that were too good to pass up, they were promptly deposited in the parts pile until [JF] was cajoled into building something by a friend. Given that each display’s pins were in parallel, there was a lot of soldering to connect these displays to the clock’s ATMega328P brain. On the back of the clock’s perfboard skeleton, a DS1307 real-time clock and coin cell keep things ticking along smoothly. The case is laser cut out of acrylic with an added red filter to up the contrast of the display, presenting a crisp, crimson glow. We love word clocks because there are so many ways to configure them and for the oddities. That isn’t to say radial clocks are any less creative.